Katie Hennessy is an extraordinary asset to Polk County’s agricultural community. 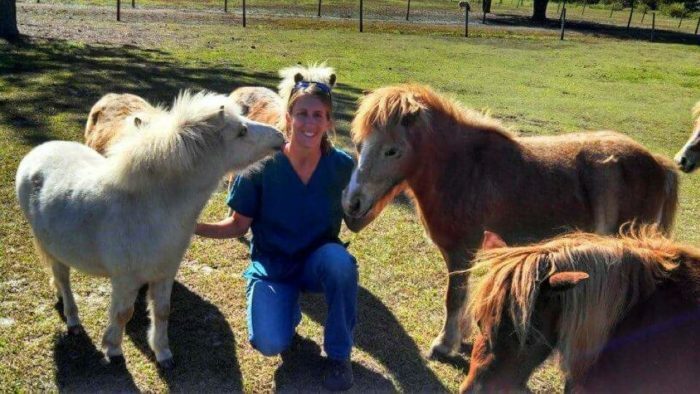 She is an equine and large animal veterinarian who operates the Polk Equine mobile clinic in Lake Wales. Hennessy is a compassionate caretaker of these great creatures with a long history of involvement with horses and other animals. Hennessy grew up in Illinois, in a Chicago suburb called Arlington Heights. She attended the University of Illinois at Urbana-Champaign for her undergraduate degree and veterinary school. This was followed by an internship at the Equine Medical Center of Ocala from 2008 to 2009. She worked at Orlando Equine for three years after that, and then came to Polk County. A love of animals was instilled by her family at an early age. “We always had horses and dogs and critters,” recalls Hennessy, “it was just kind of part of our lives and I followed that track. When we were young, my grandparents had a farm. They had ponies and horses that we would ride.” Katie Hennessy and her twin sister, Erin, were given a pony of their own, and when they were a bit older a horse. These experiences created a lasting impact on Hennessy, inspiring her to devote her career to caring for horses and other large animals. Hennessy may have left Illinois with plans to return to her family there, but Central Florida offered irresistible possibilities. She was able to join the Polk Equine practice and purchase it after a year, which sparked Hennessy’s entrepreneurial spirit. “It was a life goal of mine to have my own practice, and I achieved that here,” she says. Lake Wales is an excellent place for Hennessy to operate from. She says, “I’ve got a great group of clients, they’re really awesome to work with. It’s just a great community.” Lake Wales is a very rural area, so there are plenty of horses, sheep, and potbelly pigs to keep her busy. Hennessy operates an ambulatory clinic, so wherever her patient is she goes to them. Though Hennessy is separated from her family up north by some distance, she and her sisters Erin and Megan are keeping the horse-raising tradition alive and well, passing on their equine adoration to their own children. Katie Hennessy’s two-year-old daughter Amelia loves to go along on calls and is a great little helper. It’s a family of horse-lovers, as Hennessy’s husband is Ben Moss of Circle F Dude Ranch in Lake Wales. Moss even gets in on the action with Hennessy, helping out with some of the emergency calls. Hennessy is proud of her skills as a vet. She is able to treat multiple species with issues ranging from dental problems to routine vaccinations to dangerous conditions. Her equipment is cutting edge, including a portable x-ray machine and portable sonogram machine. Plus, she has an upbeat and positive personality. When she’s not out on a call, Hennessy enjoys spending time with her own pets. She has three horses of her own, in addition to three dogs and a potbelly pig. Running is another interest she enjoys. Hennessy is very close with her family, and appreciates the support and encouragement her family has provided her over the years. She’s gratified to see more women entering the veterinarian fields, and particularly the large animal sector. So what does the future hold for Hennessy? “To continue to grow the practice and expand,” she responds. She would love to be able to hire another veterinarian and open a stationary clinic so patients could be trailered and brought in. Until then, Katie Hennessy will be on the road helping horses and other animals with Polk Equine.